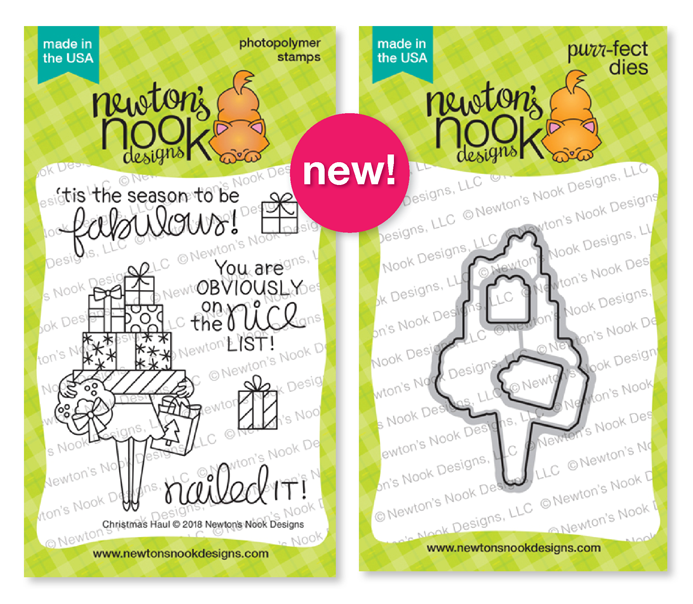 Hi all, today I'm up on the Newton's Nook Designs blog with a card I created for mailing. I love having a extra store of flat cards that I can pop in the mail. I needed extra this year, so this one is already on it's way to a friend! I just had a desire to work with blues and greys. I had a piece of this lovely grey with trees paper, so I layered that over some navy cardstock. I cut an extra piece from the navy using the scalloped die from the Frameworks Die Set. I cut a white rectangle that fit inside the stitched border and distress inked it with an ombre look. 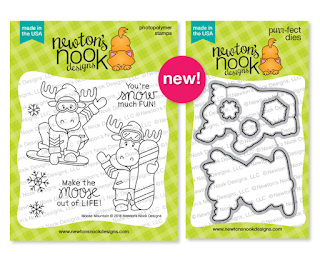 Then I stamped, diecut and copic colored the images from Newton's Christmas Cuddles. I hope you've enjoyed my card today, and I also hope you've enjoyed working on your own Christmas cards to send out some extra cheer to friends and family! Hello everyone! Wow we are getting really close to Christmas aren't we?! I've got packages left to wrap, but this year I'm feeling fairly organized! So today I'm sharing a card that I made using Hello Bluebird products over on the Butterfly Reflections Ink. Blog. I've got the products listed below with links for your convenience. This is a brand that I adore, I just love the whimsical images! Winter scene cards with critters, snow and trees are my absolute favorites! 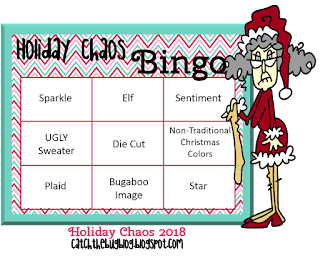 I've combined the stamps/dies from Quiet Christmas along with the Joyful die from Christmas Words #2. I inked the background in distress inks and did a little white acrylic paint splatter to show some gently falling snow. I had one little die cut snowflake sitting on my desk from the Frosty Flakes set, so I added it for a little extra. So thank you so much for stopping by, I hope you'll leave a comment and then head over for a little Christmas shopping for yourselves! Hi everyone, I'm here with you today. sharing a card I made with the new Hero Arts stamp/die set, Wonder and Magic of Christmas. I started with a Navy cardstock base and added a kraft panel cut a little smaller. I die cut the center of the kraft layer using the largest die in the MFT Dienamics Stitched Dome Stax. I also used that same die to cut a piece of white cardstock to inlay it. Then I used the MFT Drifts and Hills stencil and inked in a few snow hills. So, for my tree I used a light/medium/dark shade of blue ink to create an ombre effect. Then I stamped the deer and star using VersaMark embossing ink and Hero Arts Gold embossing powder. I die cut them using the coordinating dies. I cut a banner and white heat embossed the sentiment, which is from the same stamp set. Lastly I added some Studio Katia Iridescent Ice Flakes Crystals for some decoration. Thanks for joining me today, head over to the BRI shop and grab some of these goodies for your holiday cards! Here's a link for you if you'd like to grab this for yourself before the sale is over! So that's it, just a quick little post to show you! I'm planning to enter this card in a few challenges that I'll list below! Newton's Nook Designs 6th Annual "Deck The Halls With Inky Paws" Blog Hop! 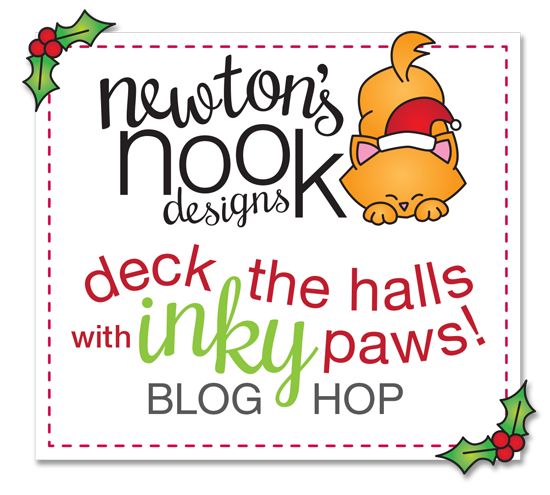 Hello everyone and welcome to the Newton's Nook Designs Deck the Halls with Inky Paws Blog Hop! 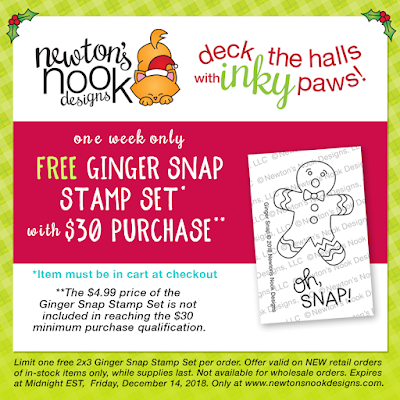 We've got awesome prizes AND a great deal on a new 2x3 stamp set, so keep scrolling! But first, I want to share a card I made for this fun event! It took me a while to choose which NND products I wanted to use. I eventually decided to give a few of my older sets some love! These little snowmen holding their mugs of cocoa are just darling! So thanks for stopping by my blog, make sure to comment on all the DT blogs for your chance to WIN! You can find the DT list below! Amanda Bodine -You are Here! Hi everyone! 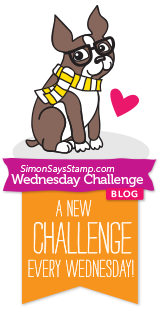 I'm here today with a winter coffee card to show you! 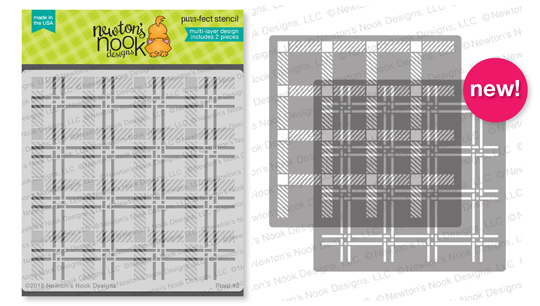 I started by cutting the plaid patterned paper in A2 size from the Jen Hadfield Warm & Cozy 6x6 paper pad. (check out all the CUTE patterns in this paper pad!). I then used the new Fa La La stencil by Neat & Tangled and used Ground Espresso distress ink over Kraft cardstock and layered that over red cardstock onto my base. I die cut and Copic colored the coffee cups from Avery Elle Cool Beans with coordinating dies. I die cut a deer from MFT Dienamics Delightful Deer in bright gold cardstock. I tucked the deer behind some natural twine I tied around the red layer. I embossed some of the kraft cardstock using Sunny Studio Cable Knit EF and then die cut the wrap that goes around the cup. I love how it gives the wrap dimension! Lastly I stamped, diecut and colored the holly from MFT Tweet Holidays and added to my cups for decoration and a pop of color! The little sentiment "Cool Beans" fit on there perfectly I thought! I'm entering this card in the 2018 Fall/Winter Coffee Lovers Blog Hop, which Butterfly Reflections Ink. is sponsoring! 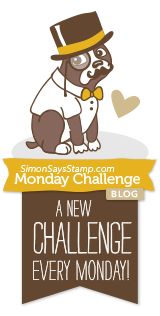 I hope you'll be inspired to create a coffee card of your own to link up! 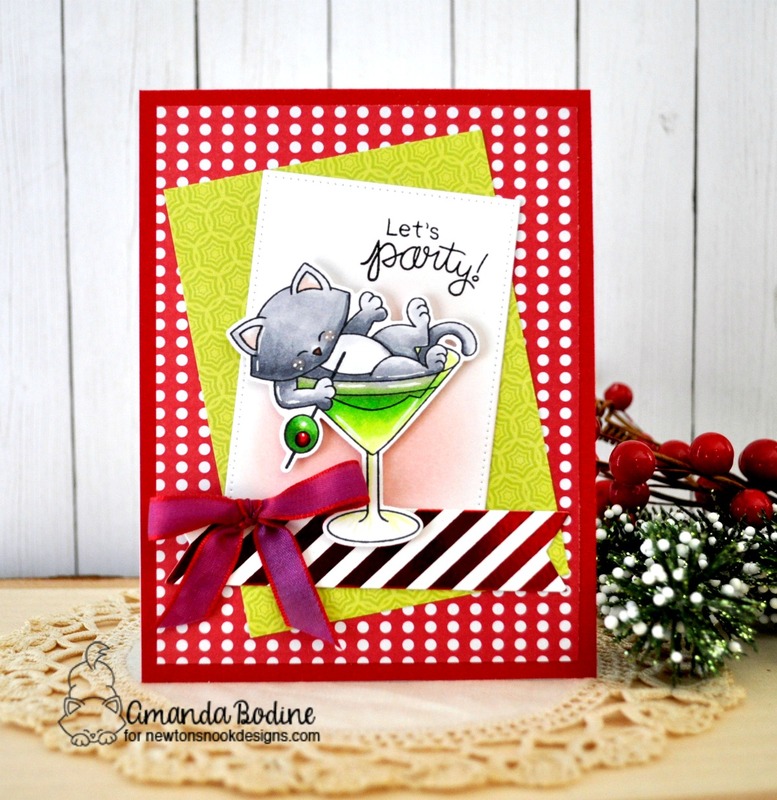 Hello everyone, I'm here getting a jump on my holiday cards and featuring these new products over in the Butterfly Reflections Ink. shop! Today I've combined two stamps sets to create my scene. 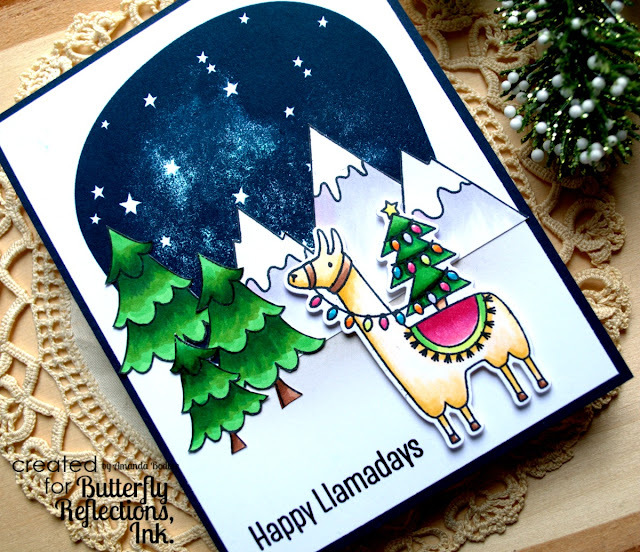 This super fun Llama set by MFT called Happy Llamadays I Copic colored and die cut this llama from that set. The sentiment "Happy Llamadays" stamped in VersaFine Black Onyx ink is also part of this stamp set. I loved this night sky from the set Starry Scene Stamp Set by Avery Elle. I stamped the night sky, then copic colored and fussy cut the trees and mountains, which was very easy. There are coordinating dies available with this set as well. I trimmed down my panel and layered over blue cardstock to add a little extra to my card. Thanks for joining me here today at Butterfly Reflections Ink. Head over to the shop for these wonderful products and so much more! 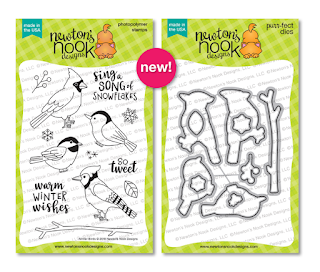 Hi all, welcome to day 3 of the Newton's Nook Designs reveals. Today is the last day, tomorrow we celebrate Thanksgiving in the U.S. and then Black Friday is here! So today, Newton finally makes his appearance! 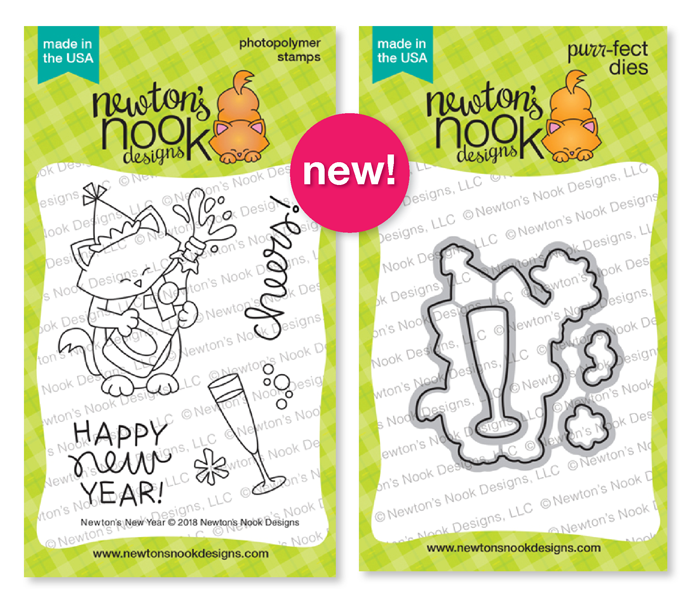 As you can see, we've got a party going on, these 2 sets are celebration/New Years themed! So for my first card I used this image from Newton Celebrates, I just thought it was adorable, but don't ask me what kind of drink is neon green, that would require an olive for a garnish. I just love green drinks and thought Newton looked cute floating in one! I love cards that use a bunch of patterns like this one, I hope you enjoy it too! 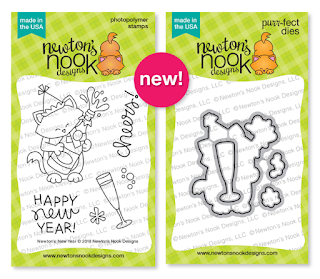 Then next up, I'm featuring the image on the left from Newton's New Year, and I borrowed a Newton from Newton Celebrates, the little guy with champagne in his hand. I hope that wasn't confusing. But I thought the 2 sets went together so well! I mounted these sweet images on a double layer of tags from the Fancy Edges Tag Die Set. Did you notice the Argyle plaid background? Yes, it's that awesome 2 piece stencil again. 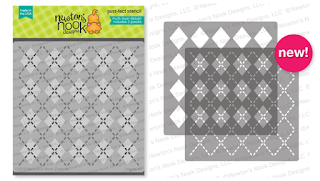 What fun to create backgrounds with both the Plaid and Argyle Stencils! Well that's it everyone, I sure have enjoyed this week and I hope you have too! Make sure to comment on all the DT's blogs to win!!! 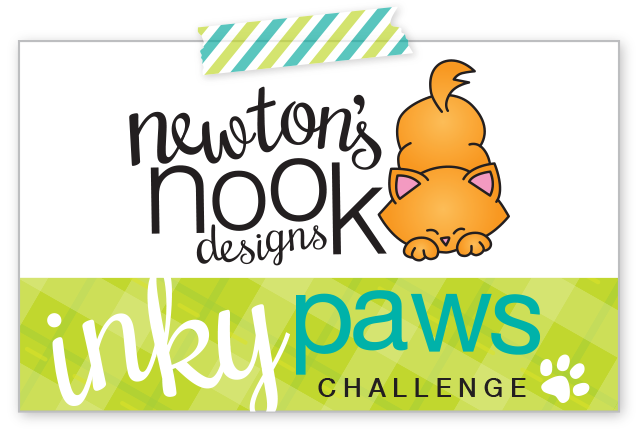 Would you like to win a $25 store credit to Newton’s Nook Designs? Comment on the NND blog and Design Team blogs (see list below)! The winner will be chosen at random from the collective reveal posts. Make sure to check out each of their blogs and comment for your chance to win. You will not know which blog will be randomly chosen so the more you comment on the better your chances are of winning! You have until Wednesday November 21st at 9pm EST to comment -- winners will be announced on the blog post on Friday, November 23rd. Welcome to day 2 of the November reveals and today, wow, we've got two amazing new stamp/die combos to show you and more of the fabulous new plaid stencil, so here we go! 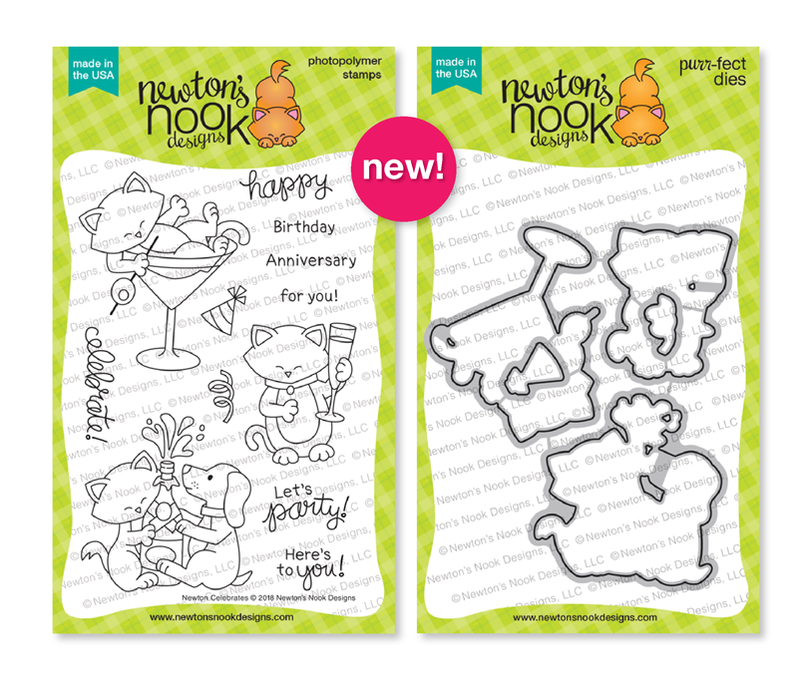 Don't forget to comment on all the DT's blogs listed below for your chance to win a $25 g/c to the Newton's Nook Designs store! 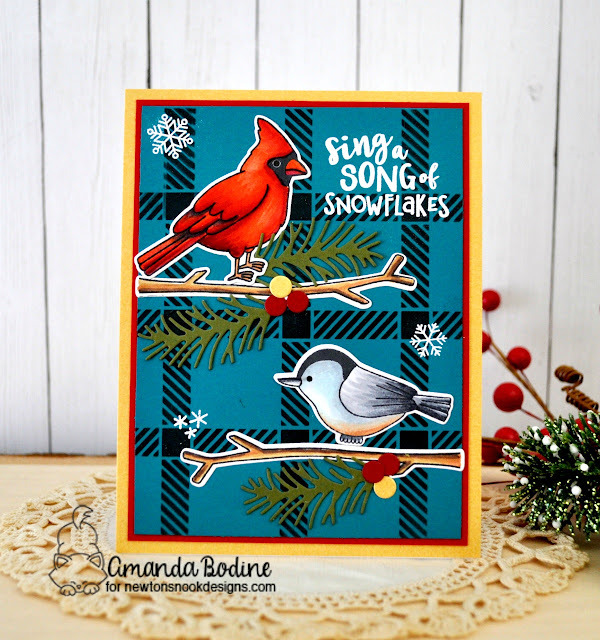 So starting with my first card, I used the new Winter Birds stamps/die combo, I adore this new set, how about you? I really enjoyed coloring these birds and plan to color many more this holiday season! As you can see, I used the plaid stencil, but this time only used the one layer. I thought it looked great and made the perfect background for my birdies! I also used the pine bough and berries from the Pines and Holly Die Set. Then comes this new Poinsettia Blooms stamp/die set, I'm in love! What about you? I just love all the floral and greenery, I enjoyed coloring this so, so much! I cut a small rectangle in black, heat embossed the sentiment in white and created a chalk board look by frosting the edges in white ink. I then foam mounted my florals and leaves in the corners and glued it on the Plaid Stencil background I created using a gold stripe on black with a little paint spatter. Hi all, I have another card to share with you today, this is a thank you card that I wanted to get in the mail today, so I took a quick picture to share with you before it's gone. 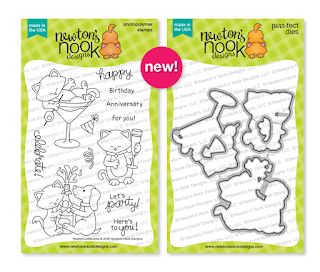 This is a really simple one layer card, perfect for mailing thank yous for holiday gifts. I plan to make a few more to have on hand! 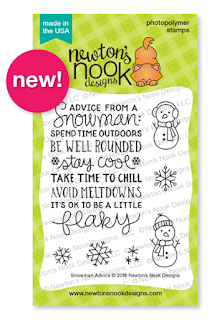 I started by cutting a hill using Newton's Nook Designs Land Border die. I used it as a mask to create my snowhills. Starting from the bottom of the card and working up, I used Tumbled Glass distress ink lightly to shadow the tops of the hills. I stamped the top line of trees in VersaFine Black Onyx ink from Winter Woods Stamp set and left the mask on, so the tree trunks would be tucked away behind the hill. I inked my night sky using a few darker shades of blue, then stamped my sentiment up top. I added two pines from Winter Woods and one little die cut from Dashing Deer using Mossy Meadow and Old Olive Stampin Up inks. Super easy and fast card, but looks like you spent a lot of time! Thanks for joining me today, I hope you'll leave a comment to let me know what you think! Hi everyone, I'm up on the Butterfly Reflections Ink blog today with a project I created using my favorite theme, nature and deer combined! Add in a little distress inking and WOW! So I started with an A2 sized panel. I cut a hill using Newton's Nook Designs Land Borders to create a mask for the bottom. I distress inked from center of my panel, working outward using a combination of yellows, greens and blues. I inked all the way down to the hill, then removed it to leave the white of the card appearing to be a snow hill. Now I take this GORGEOUS stamp, All Lit Up by Penny Black and stamp it using VersaFine Black Onyx ink. Using my MISTI, I was able to stamp it twice to get a nice dark impression. I then cut white acrylic paint 50/50 and tapped it on my night sky using a small paint brush. You'll notice on the image, there are little circles where you'd color in your lights or ornaments. I chose to use Nuvo Drops in gold and silver. While all that was drying, I cut out a deer from Lawn Fawn kraft paper using MFT Die-Namics Delightful Deer. I sponged the underneath of the deer in Ranger Frayed Burlap Distress ink. Lastly I cut a banner in black using MFT DieNamics Stitched Sentiment Strips and heat embossed the sentiment from Lawn Fawn's Thanks a Latte stamp set. So my card was all dry and ready for me to glue down the banner and foam pop the deer to finish my scene! Thanks for joining me today, make sure to run over to the Butterfly Reflections Ink. 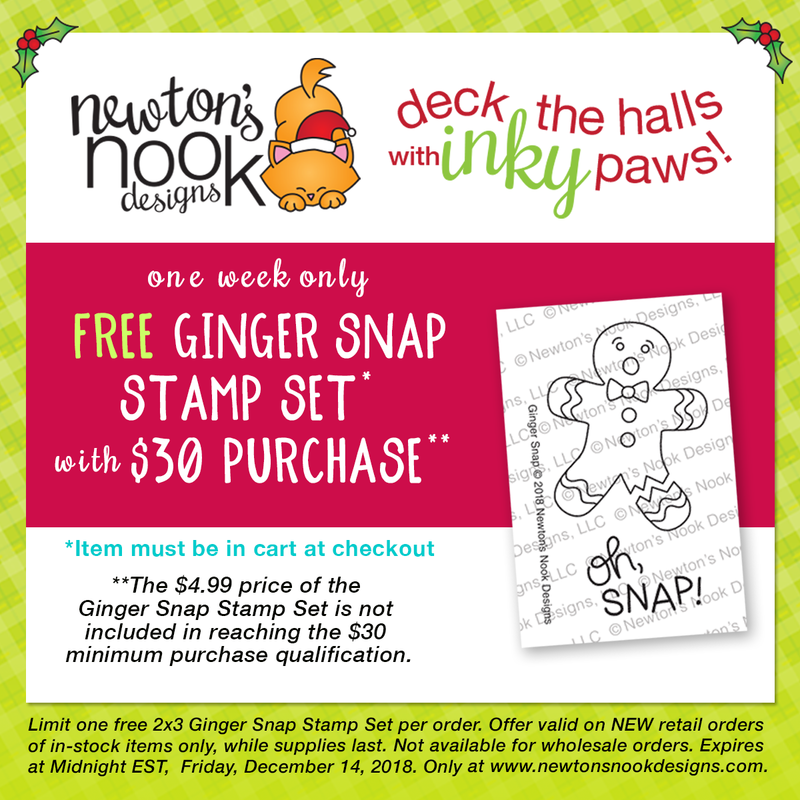 shop and grab some of these awesome products for your holiday cards! 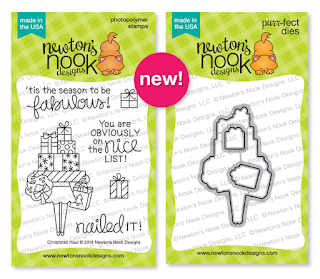 Hi everyone, I'm here today on day 1 of the November reveals with Newton's Nook Designs. I am SO excited to show you all of these amazing new products. There will be 3 days of reveals this month, then we celebrate Thanksgiving here in the U.S., then onto Friday when all these great new products will be available. Oh! And don't forget it's Black Friday, which means a great SALE! So onto the cards I made to show you today! Before I forget, each day this week, NND is giving away a $25 g/c to their store. So make sure to hop along and comment on all the DT's blogs, for your chance to WIN! Beginning with my first card using Moose Mountain stamp/die combo. I'm sooo excited that Jen has created this adorable guy for the NND line, I just love moose and this one is my new favorite! As you go through my cards, you may notice a theme this week, plaid! 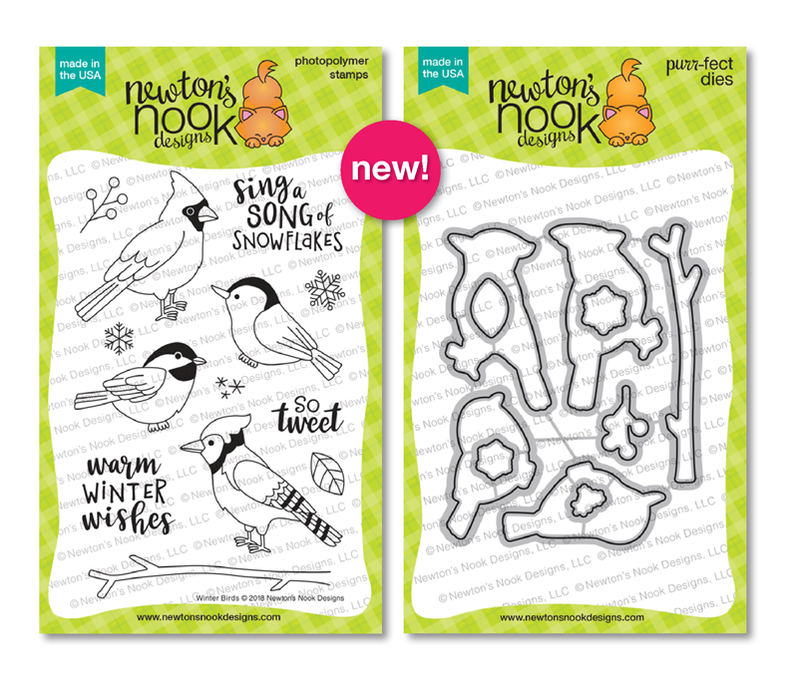 We're all so excited to show you 2 new stencils. 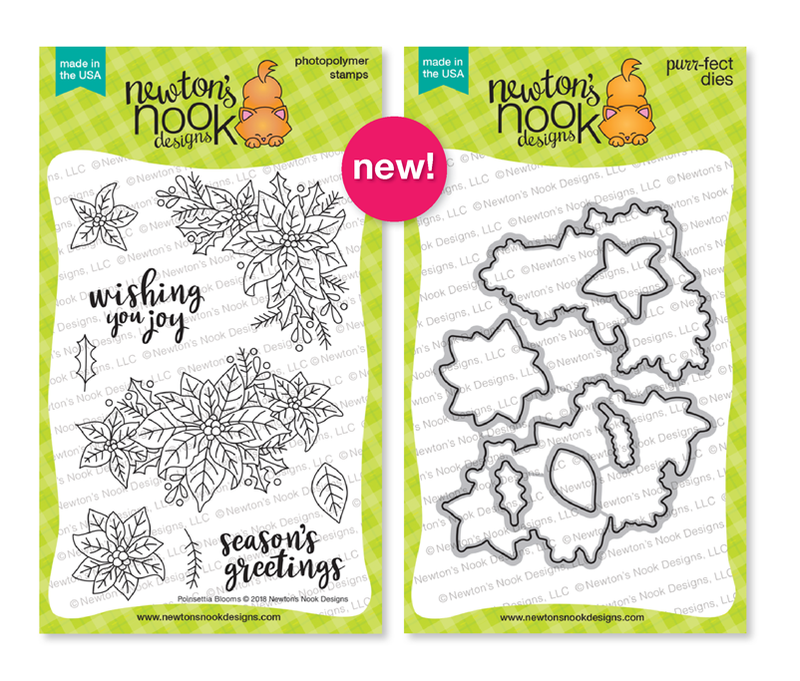 Both of them are 2pc and create an endless amount of patterns/designs! As you can see on my moose card, I created the background using the Plaid Stencil. I heat embossed snowflakes and white paint splattered over the plaid to give it a frosty/cozy look. The tree is from the Forest Scene Builder die set and that little snowman? Well, I cut him out from another set that you'll see below! Next up is the set, Christmas Haul. 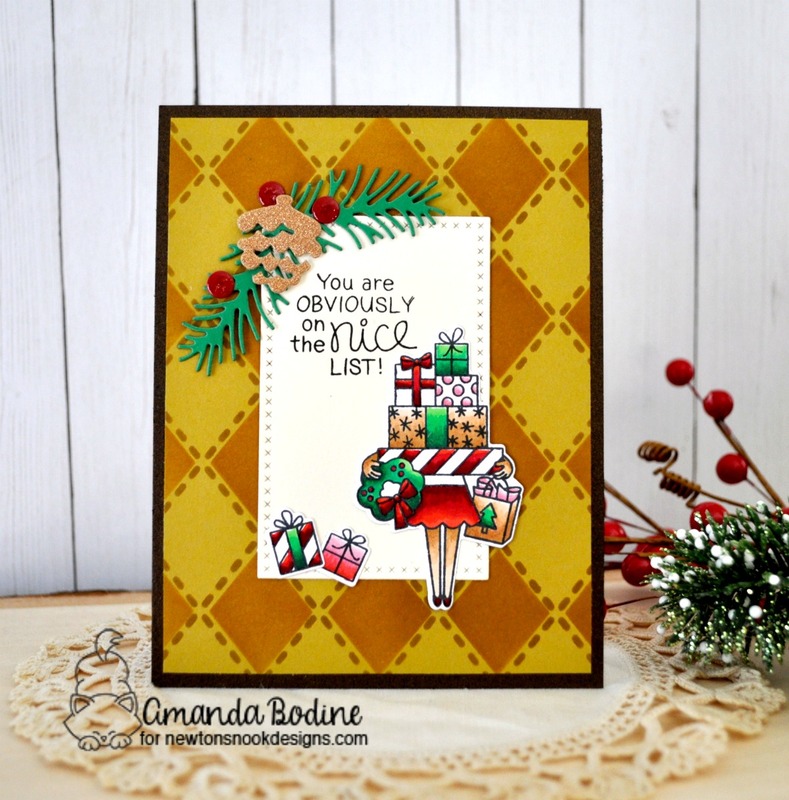 This is a stamp/die combination and I just adore all those packages and sentiment! You'll notice my background, it's the Argyle Plaid 2 pc stencil! This is one way to show it off, but stay tuned, I'm using it on another card later in the week and it looks completely different! 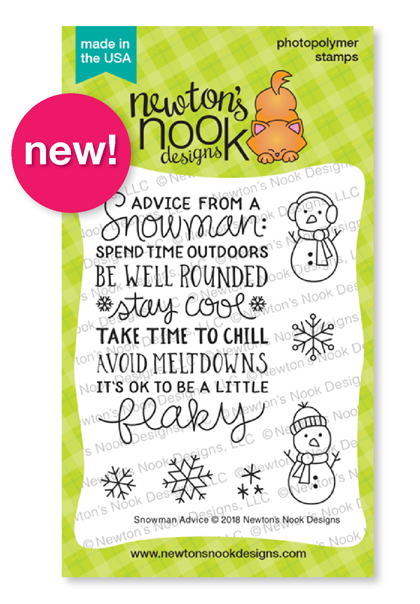 Lastly this fun little stamp set called Snowman Advice. 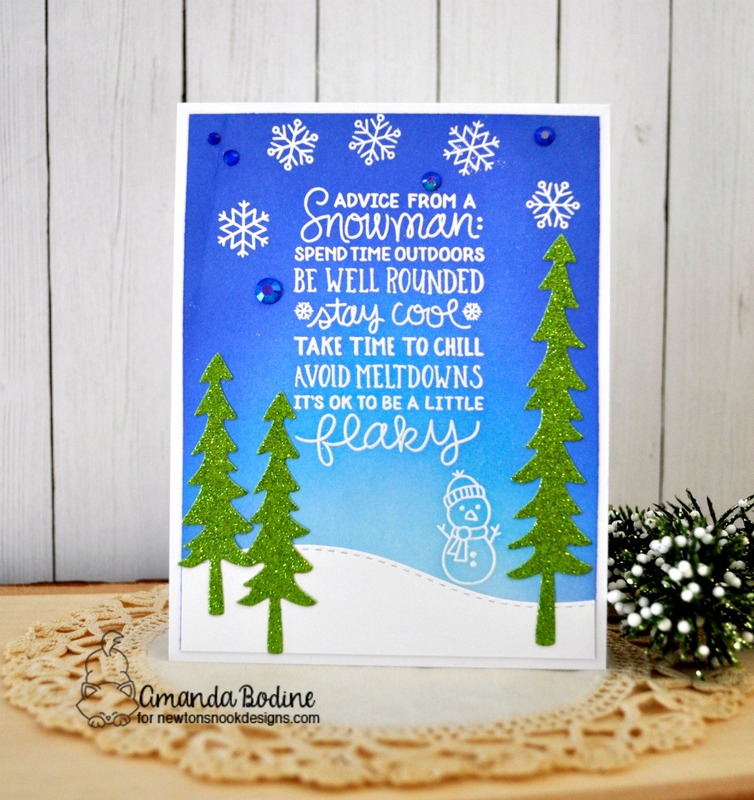 I white heat embossed that great sentiment, along with some flakes and a tiny little snowman. Then I used a few different blue distress inks and sponged over my white embossed images. I cut a hill out using the Land Borders die set, and some sparkly green trees using the Forest Scene Builder Die Set!